We are watching Jessica Soho at GMA 7 when the phone rang, it was mother in law with a shocking news. She just heard that DILG Secretary and former Naga City Mayor Jessie Robredo with another two people are believed to be missing on the sea of Masbate. Robredo is one of her faculty members along with his wife Atty. Robredo when she was a Dean at the Universidad of Sta. Isabel, Naga City. Sec. 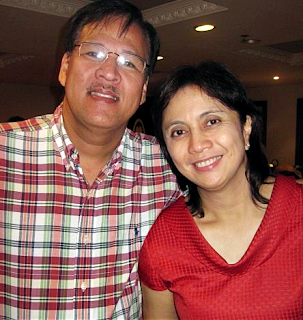 Robredo is one of the very down to earth political man i have met and seen in my life. You can just see him walking on the street of Naga during Peñafrancia Feasts and he was not very hard to approach. Although, he looks like a silent type person, many would attest that he was an upright and true to his words. Today, at 3 pm, the DILG Secretary Robredo was aboard a small plane bound to Naga City coming from Cebu where he attended a seminar. News says that he was supposed to board Cebu Pacipic where he has previous arrangements but he instead chose to ride Piper Seneca with Jessup Bahinting, owner and the pilot on board. His wife, Atty. Leni Robredo even told the media that she was able to talk with Sec. Robredo saying that they have indeed experiencing propeller problems until the phone was off, probably the same reason that the aircraft has already crashed in the waters. It was indeed a sad news for many Nagueños, especially the fact that Sec. Robredo had been the city father for 6 - 3 year terms which equivalent to 18 years. He won in 1988 making the Philippine city youngest mayor at the age of 29. Because of his dedication and hard works on making Naga City of what is today, he was awarded with numerous awards from the Philippines and from the other countries including the Ramon Magsaysay Award for Good Governance in the year 2000 and the 1996 Outstanding Young Persons of the World. Because of his undeniable help to President P'noy's on the last election, he was assigned as DILG secretary. Even with his utmost effort to provide dedicated service to the agency, he still faced different controversy and his appointment was pending up to this moment. At the moment, we joined the many people who are praying for his safety. I believe that Ina would protect him. Today, August 21, 2012 is another sad day for many Nagueños, as one of their beloved public servant and dedicated father of the city was already found by the divers and confirmed dead at 8:45 am, said Sec. Mar Roxas. On the breaking news, Sec. Roxas said that the family was already learned the sad news and the President wanted to make sure that they are comforted on this great loss. It was indeed a sad moment not just for the Robredo family but for many, he will surely be missed. There are only few men that are honest and dedicated. Today, another hero died, in different era, different way. We may be grieving but in our hearts, we are happy because I know that he will surely be in the side of our Almighty God who only knew the real reason for his untimely passing. My deepest condolence to the Robredo Family, to Ma'am Leni and their three kids. I know that no words can console you now, the pain can be incomparable.